The living room of Unit 5 at 2500 Smallman. Photo by Ed Massery. It’s not Cork Factory Lofts part two. 2500 Smallman is a wholly different city living option offered by Chuck and Kristen Hammel who were part of the development group for the pivotal Strip District project. The boardwalk is suspended over the drive-in courtyard. Photo by Maya Henry. The 11 new homes at 2500 Smallman have access to many amenities and high-end features you might find in a contemporary loft or condo development. No surprise there. 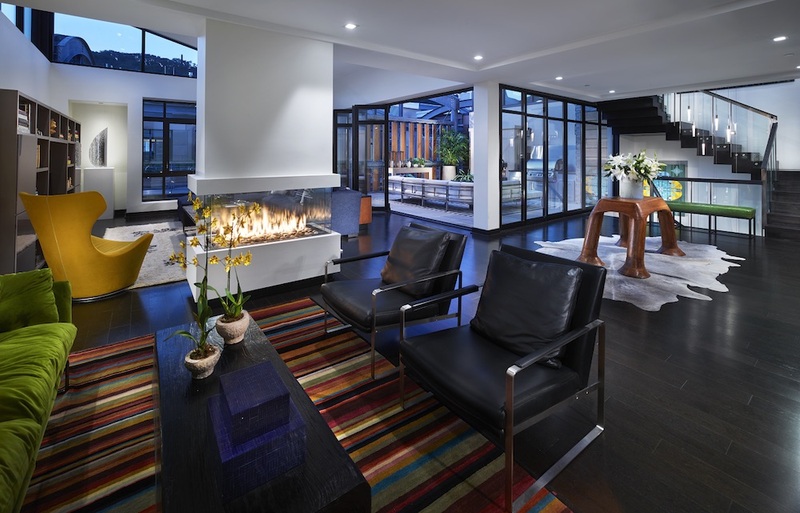 What is surprising is the project’s design by the team at Desmone Architects as a mini-community facing inward around a shared courtyard and “boardwalk” as well as the different design elements of steel, stone and cedar that make this project so richly textured and stunning. When the Hammels announced the project in 2014, their goal was to reuse the old 65,000-square-foot Pitt Ohio trucking facility to create 11 very spacious “city homes” ranging from 3,450 to 5,985 square feet. In size and in design, there’s nothing else like it in the city. Owners can completely customize the homes and enjoy high-end communal amenities such as a fitness studio, around-the-clock security, a caterer’s kitchen and a spacious patio area for gathering. The location, in the heart of the Strip District close to the riverfront and a couple of miles from downtown, is key. One of the new owners is an empty nester moving from Mt. Washington who wants to get rid of her car in order to bike, walk or Uber to her destinations. “Originally the demographic was empty nesters,” says Darla Jobkar of Northwood Realty. “After the project was further along we really did a 360 because we saw that there was a wide age range interested in living in a place with a community feel.” The youngest owner so far is 29, says Jobkar, adding that the first occupants will move in November 1st. Five of the 11 two and three-story city homes have been purchased with the sixth under agreement. Units range from $1,650,000 to $3.4 million. The courtyard of 2500 Smallman features hand-stamped concrete and stone elements. Photo by Tracy Certo. Architect Eric Booth, leading the design team at Desmone, was inspired by the courtyard-centered apartment buildings of Italy in creating the concept. Owners drive their cars up a ramp through one of the old truck bays into an open-air courtyard of hand-stamped concrete –which features a snowmelt system — and directly into their private garages. There are also ramps for accessing the courtyard on foot or by bike. “People love that the design is of Pittsburgh, that you are in the heart of Pittsburgh but it is your own special enclave,” says Booth. 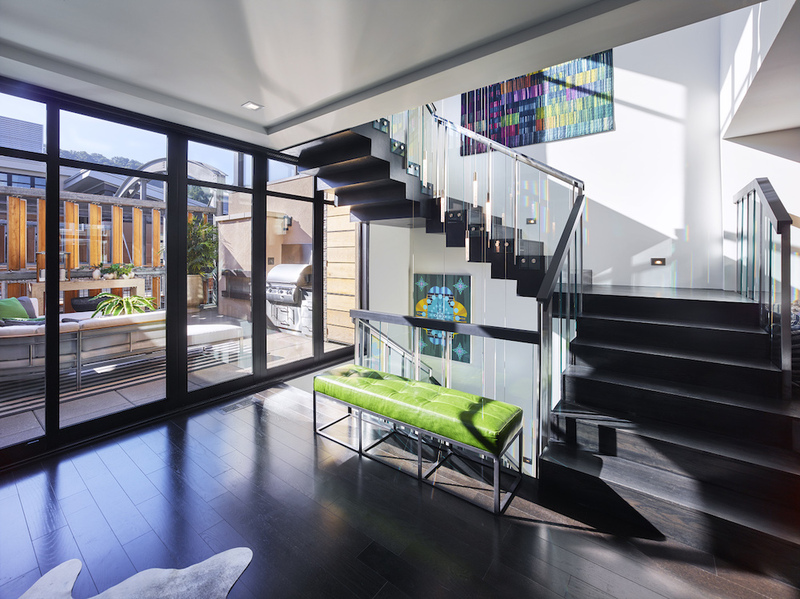 Visitors can be buzzed in through the lobby and take an interior staircase or elevator that leads to the boardwalk system suspended above the courtyard. 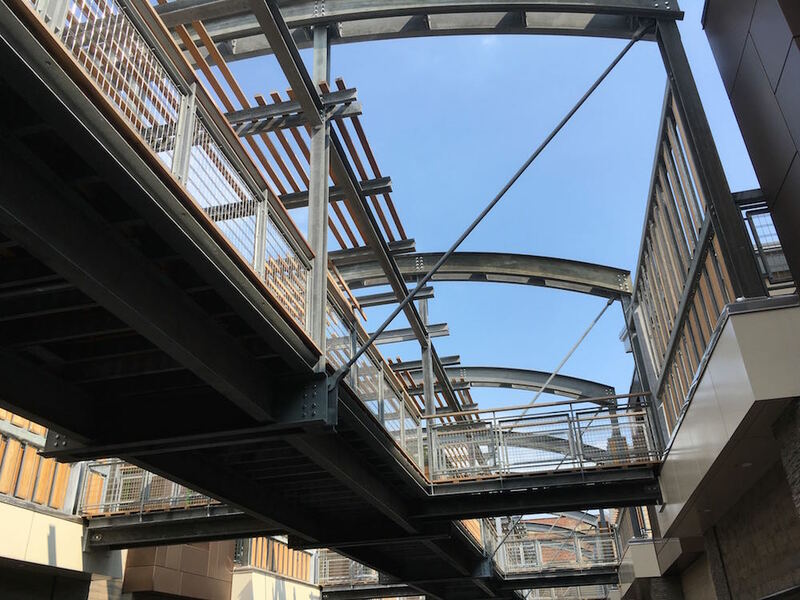 The boardwalk’s truss system has a steel bridge motif inspired by the underside of Pittsburgh’s bridges that was inspired by Booth’s bike rides around the city. The boardwalk and truss system are inspired by architect Eric Booth’s bike rides around Pittsburgh. Photo by Maya Henry. 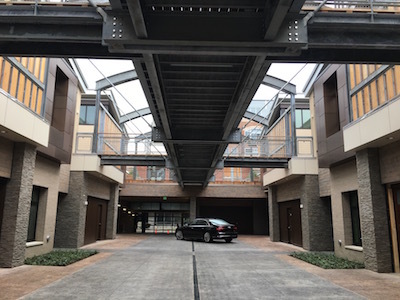 The building is still present in the design in some elements, from the driveway that uses the old loading entrance to the fact that most of the window openings were kept intact and steel beams from the roof were repurposed as structural elements in the units. The reuse of the building is at the core of its sustainability—all units were registered with the USGBC under the LEED for Homes program, and each owner has the option to seek certification. Each home features a stormwater management system—rain barrel included. 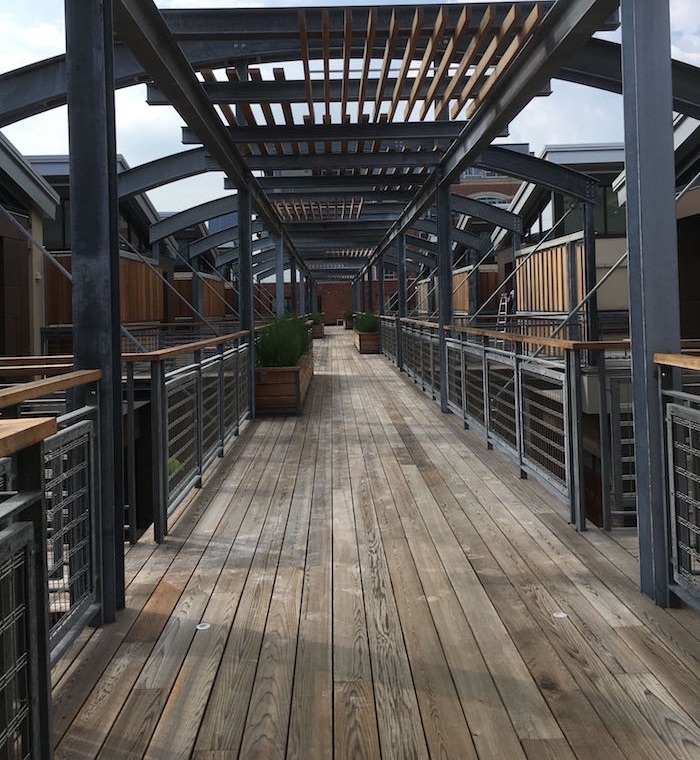 The vegetative roofs on the units mitigate stormwater runoff and increase energy efficiency as do the light fixtures and radiant heat floors. Adding to the project’s sustainability is the use of locally sourced materials and features. The concrete was hand-stamped by Rockaway Concrete and Guardian Construction was the contractor. More information on 2500 Smallman can be found on the website. Unit 5 at the development was Pittsburgh Magazine‘s Ultimate House for 2016. More info can be found here. Nancy Policicchio at Desmone was the primary designer of the interior spaces and layouts. Unit 5, the largest at three stories and 5,985 square feet. Photo by Ed Massery.